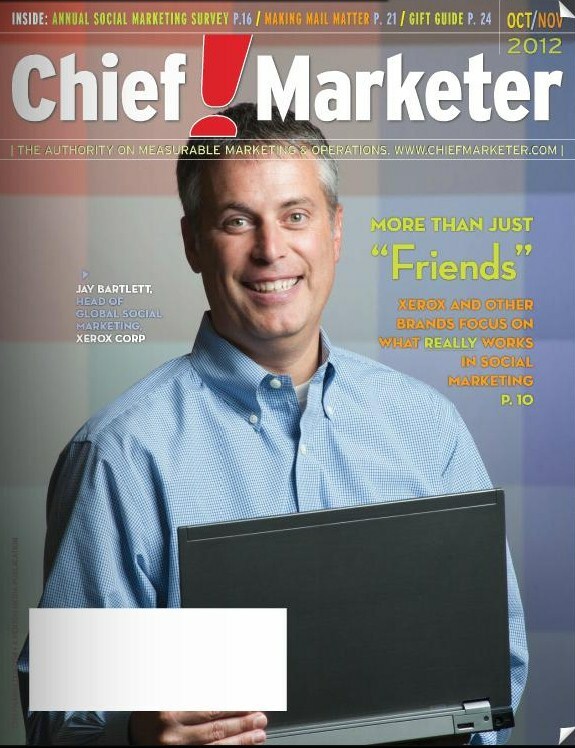 The other day I opened my mail box and was surprised to find a copy of Chief Marketer Magazine. I don’t remember subscribing to it, let alone pay for subscription. I might have just ordered a free copy. Nevertheless, I spent a nice evening om the couch reading this 48-page magazine. There were some interesting ideas about Pinterest and such, but a good amount of materials was about email marketing. Anyways, it is still there. What surprised me the most was the cover. A photo of Jay Bartlett, Head of Global Social Marketing at Xerox, pictures him carrying a very old-fashioned Dell laptop. Like 10 years old! I am not a die-hard Apple fan and I didn’t expect to see a Mac but why on the Earth would you have a cover story with such a lame photo? OK, Xerox doesn’t make laptops. Whay to have a photo of a top guy with a laptop then? Or is it just an old photo? Seems like someone at Xerox PR department doesn’t do her job. Bad impression overall. Now back to the magazine itself. The subscription is $49/year. Not too bad for a niche magazine but why pay when you can read it for free online. Talking about saving some bucks and going green:) Might be reading it from time to time.